Test bench of the first two prototype crab cavities in the Super Proton Synchrotron (SPS) accelerator. The cryomodule containing the cavities is installed on a mobile table that allows it to be moved into the beam line as needed. CERN has successfully tested “crab cavities” to rotate a beam of protons – a world first. 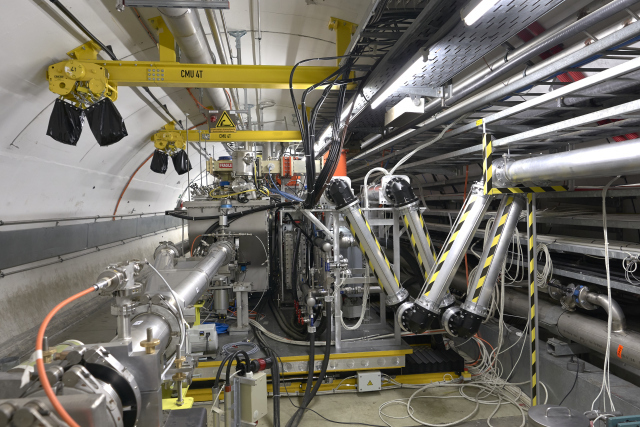 The test took place on 23 May using a beam from CERN’s Super Proton Synchrotron (SPS) accelerator and showed that bunches of protons could be tilted using these superconducting transverse radiofrequency cavities. These cavities are a key component of the High-Luminosity Large Hadron Collider (HL-LHC), the future upgrade of the LHC. The HL-LHC, which will be commissioned after 2025, will increase the luminosity of the LHC by a factor of five to ten. Luminosity is a crucial indicator of a collider’s performance: it gives the number of potential collisions per surface unit over a given period of time. In other words, the higher the luminosity, the higher the number of collisions and the more data the experiments can gather. This will allow researchers to observe rare processes that occur beyond the LHC’s present sensitivity level. Physicists will also be able to perform precise studies of the new particles observed at the LHC, such as the Higgs boson. The newly developed crab cavities will play an important role to increase the luminosity. In the LHC, the two counter-rotating beams are not a continuous stream of particles but are made up of “bunches” of protons a few centimetres long, each containing billions of protons. These bunches meet at a small angle at each collision point of the experiments. When installed at each side of the ATLAS and CMS experiments, the crab cavities will “tilt” bunches of protons in each beam to maximise their overlap at the collision point. Тhis way every proton in the bunch will be forced to pass through the whole length of the opposite bunch, increasing the probability of collisions and hence more luminosity. After being tilted, the motion of the proton bunches appears to be sideways – just like a crab. Crab cavities were already used in the KEKB collider in Japan for electrons and positrons, but never with protons, which are more massive and at significantly higher energies. “The crab cavities are expected to increase the overall luminosity by 15 to 20%,” explains Rama Calaga, leader of the crab cavity project. The two first crab cavity prototypes were manufactured at CERN in 2017 in collaboration with Lancaster University and the Science and Technology Facilities Council (STFC) in the United Kingdom, as well as the U.S. LHC Accelerator Research Program (USLARP). The cavities were assembled in a cryostat and tested at CERN. They are made of high-purity niobium superconducting material, operating at 2 kelvins (-271°C), in order to generate very high transverse voltage of 3-4 million volts. The cavities were installed in the SPS accelerator during the last winter technical stop to undergo validation tests with proton beams. In the coming months, the cavities will be commissioned to their nominal voltage of 3.4 million volts and will undergo a series of tests to fully validate their operation for the HL-LHC era. A total of 16 such cavities will be installed in the HL-LHC – eight near ATLAS and eight near CMS.